Pentaho supports different versions of Hadoop distributions from many vendors such as Apache, Cloudera, DataStax, Hortonworks, Intel, and MapR. 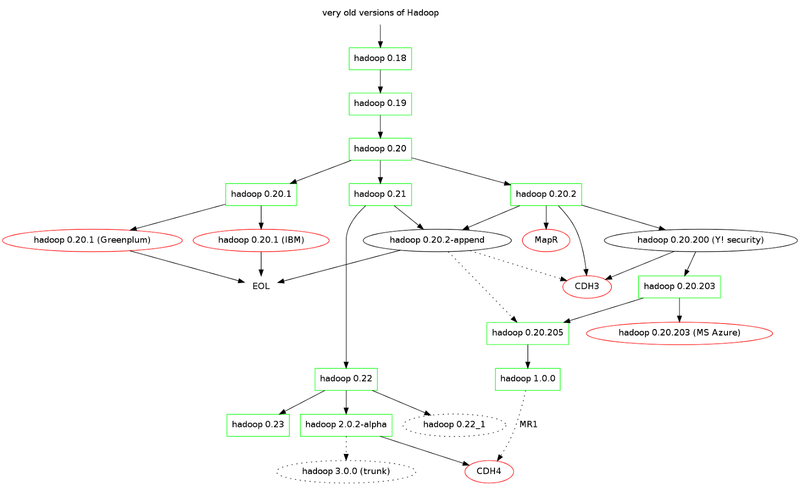 How can Pentaho support so many Hadoop distributions? The secret is that Pentaho uses an abstraction layer, called a shim, that connects to the different Hadoop distributions. A shim is a small library that intercepts API calls and either redirects or handles them, or changes the calling parameters. Periodically, Pentaho develops new shims as vendors develop new Hadoop distributions and versions. These big data shims are tested and certified by Pentaho engineers. The following Steps will help you get Pentaho set up to work with your Hadoop cluster. Pentaho is pre-configured for Apache Hadoop 0.20.2. If you are using this distribution and version, no further configuration is required. In the following table, click the tab of the Hadoop distribution that you are interested in, then locate the version of the distribution you want to use. Note the name of the corresponding shim and the minimum version of the Pentaho software that supports it. For example, if you want to use the Cloudera's CDH 4.2.1, click the Cloudera tab, then look in the Hadoop version column. CDH4.2.x is supported with shim cdh42. You need to have Pentaho Business Analytics (or Pentaho Data Integration) version 5.0 or later installed to use this shim. + Pentaho Suite Ver is the earliest version of the Pentaho suite that supports this shim. Subsequent Pentaho versions will also support this shim unless otherwise noted. ** 5.0.4 - Only supported with Big Data Plugin 5.0.4 or later. EE Customers can upgrade to 5.0.4 by going to support.pentaho.com CE Users can upgrade by following the Upgrade Hadoop in Community Edition to 5.0.4 instructions. Go to Install Hadoop Distribution Shim for instructions on how to install the shim. If the Hadoop distribution you want is not listed as supported in the table. Look at the table of Jira cases below. The shim you want might be scheduled for development, but not yet released. You can request that Pentaho develop one, fill out a Jira ticket. It is possible to develop it yourself, check out the Hadoop Configuration page for more information. These steps apply to DI and BA Servers as well as the design tools Spoon, Report Designer, and Metadata Editor. Specify which Hadoop Distribution (shim) you want to make active. You must do this for each Pentaho application that needs access to the Hadoop cluster. Only one distribution can be active at a time; so each time you change the distributions or version, you will need to reset the active Hadoop distribution. CDH 5 users who want to configure CDH 5 to use Map Reduce 1 instead of Map Reduce 2, follow the instructions in Additional Configuration for using MR1 with CDH5.